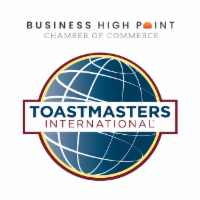 $56 covers a six-month membership and club dues for the HP Chamber Toastmasters Club. If you are a new member, there is a one-time $20 fee for materials and registration with the International organization. We invite you to join us for this new adventure! Complete your application here & bring it with you to the meeting. Please park in overflow lot across from Time Warner Cable.